In this chapter you will find detailed information on how to create a video stream from captured frames in C#. To implement this function, OZEKI Camera SDK has to be installed and a reference to OzekiSDK.dll has to be added to your Visual Studio project. Creating a video stream is a widely used method to get customers and maintain their interest in products and businesses. 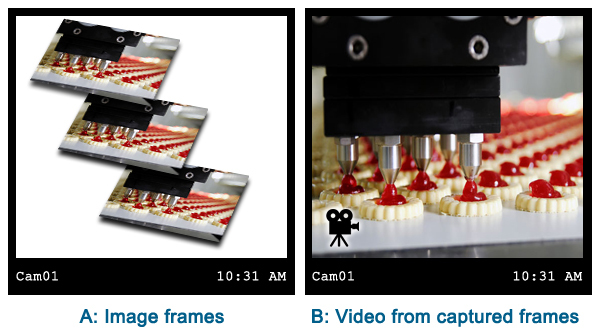 With the help of the video creating function of the Ozeki Camera SDK you can design customized videos from the image frames you wish to use. From now on, you can easily create short campaign movies or product specific advertisement for your business. You can demonstrate the strength and the advantages of your business and create efficient presentations by using OZEKI Camera SDK. On top of this the video creating function can also be useful if you wish to supervise areas and territories (where a camera is placed). For example you can create a video from the frames which were taken at a parking area or a similar public place. At the initialization of the instance you should provide the path of the folder to extract the image files. This guide demonstrates how you can create video stream from captured frames with your C# camera application. On this page you can find detailed information and a code example to implement your idea. This function works with USB, IP and ONVIF IP cameras as well.